Crab and shrimp pot pullers lead a hard life. Pullers and haulers are one boat part that is exposed to the elements, harsh weather, hard operation usage and general negligence for it’s entire service life. Whether it is a small pocket puller used in an oarlock or a gas or electric pot puller pulling hundreds of pounds, pot pullers must do the work without fail. There are three main types of pot haulers; manual, electric and gas operated. The choice of this marine part is based on how often you intend to use the hauler (recreational or professional), the weight of the pot and the power source available on-board the vessel. Manual crab and shrimp pot pullers are great for smaller vessels with limited power and limited use with pot weights less than 100 pounds. 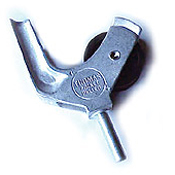 The smallest pot puller is designed to be used in a dinghy or rowboats oar lock. The Pocket Puller fits right into the oarlock (which you could mount on the transom) and allows hand line hauling without being near the gunwale or transom. The Handy Hauler is a davit with a block on the end of it. Rated at 300 pounds capability, the Handy Hauler may be used by hand or with a user supplied motor for the davit or on the gunwale. 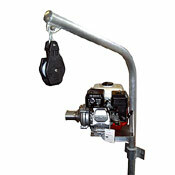 The Honda powered gas pot pulleris an option for those boats that want to avoid electric motors. The biggest advantages are the incredible line speed of 180 feet per minute coupled with the heaviest lift capacity of 550 pounds. For the professional who needs speed and hauling capacity as well as the rugged reliability of the Honda engine, this puller meets the needs.